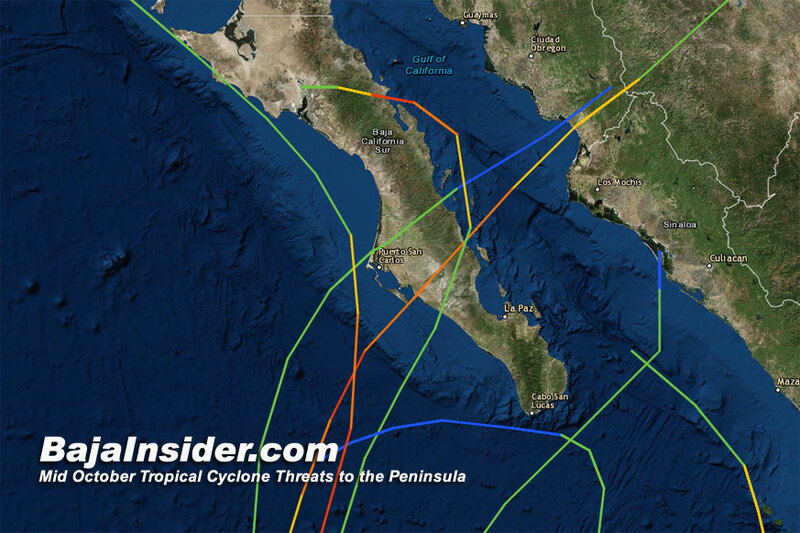 » When Does the Baja Hurricane Season End? When Does the Baja Hurricane Season End? October 17 marks the statistical end of the Baja Tropical Cyclone Season, but we can never count on Mother Nature to be aware of the statistics. No named level system has made landfall on the Baja peninsula after October 17, since the NHC began compiling records for the Eastern Pacific in 1948. Although the weather may have cooled across the peninsula, the Sea Surface Temperatures will remain high enough to support cyclonic activity for a few more weeks. So we can't turn our back on the tropical Eastern Pacific until the end of the month. So what is the historical record for the month of October for the peninsula? The first two weeks of the month have brought a few landfalls to the peninsula, mostly of weaker systems, often of Tropical Storm intensity. Baja gets its most powerful systems from the last week of August to the third week of September. Statistically, then probabilities fall off slowly through October 7, then fall to zero by October 17th. The latest landfall of a hurricane was that of Hurricane Olivia. Olivia first made landfall on the Pacific coast as a contender for the latest Tropical Storm on October 13, 1967. 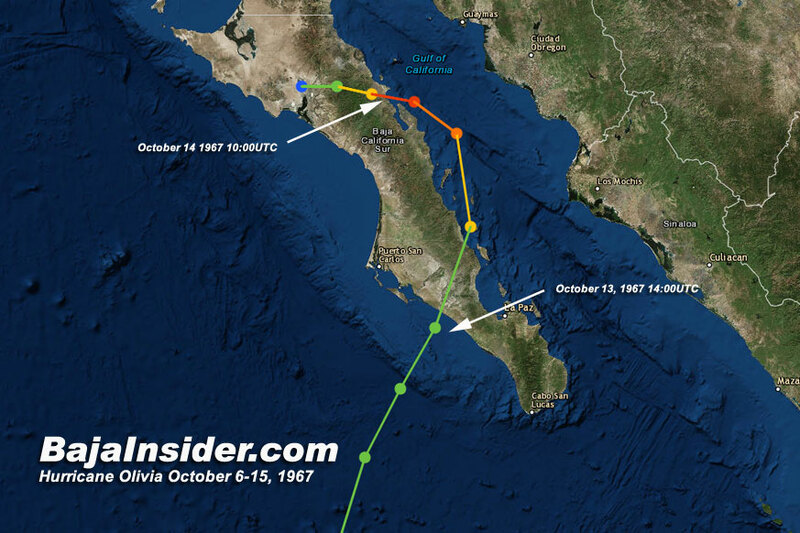 Olivia then crossed the peninsula and quickly regained strength, reaching Category 3, diminishing to Category 2 before making landfall again on the peninsula near Mulege on October 14, 1967. Olivia really messed up the little pueblo of Mulege on the only year round river in the southern state. Flooding in the river basin was extensive and several lives were lost at a time when advanced warning to the remote area was limited. The runner up to the latest landfall of a hurricane was on October 11, 2009 when Category 2 Hurricane Norbert made landfall at the southern end of Magdalena Bay and ripped across the peninsula to emerge on the Sea side, still as a Category 2 Hurricane near Loreto. The latest landfall of a Tropical Storm is less clear. 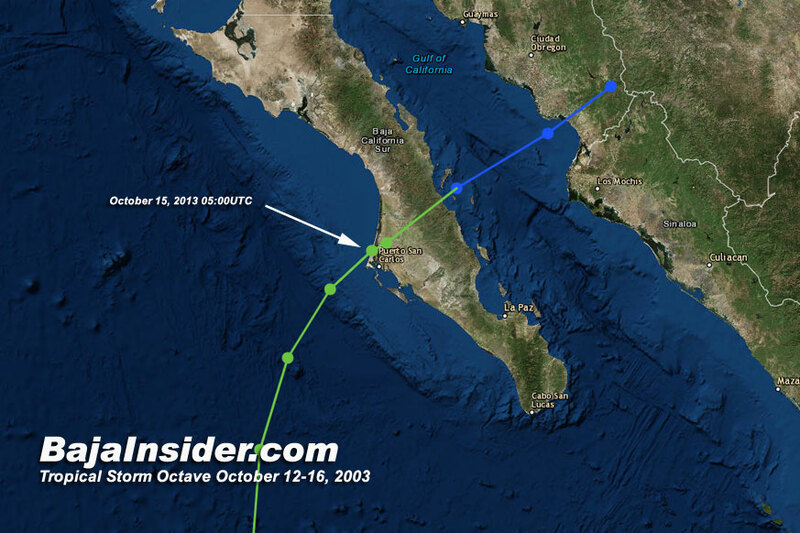 Tropical Storm Octave may have the strongest claim to October 14, 2003 at 10PM MDT when it made landfall near San Carlos on the Pacific coast and crossed the peninsula to emerge into the Sea just south of Loreto. A dubious contender is 2012's Tropical Cyclone Paul. On October 13, 2012 a Tropical Depression formed about 800 miles to the south-southwest of Cabo San Lucas. Most wrote off the late season storm as another that would wander off harmlessly along the ITCZ to the west. But Paul favored a more northerly track and achieved Category 3 Major Hurricane Intensity just about 300 miles southwest of Cabo San Lucas. Paul continued northward, passing just west of Puerto San Carlos, hammering the port city before strafing the Pacific coast from San Ignacio to Puerto Eugenia as a Tropical Storm on October 17th. Of interest however is that the data plots for Paul have the system reduced to a Tropical Depression on its approach to San Ignacio and the eye center never actually makes landfall, the peninsula is just outside the forecasted eye diameter. So we note Tropical Storm Paul as the latest landfall of a named level system on October 17th... with an asterisk. An honorable mention must go to another Tropical Cyclone Paul in 2006 which passed just 50 miles south of Cabo San Lucas and northeast across East Cape on October 25th. Paul raked the southern coast of the peninsula with Tropical Storm force conditions, but died in the Sea of Cortez without making landfall. But just as the last several years have marked a distinct change in the earliest storm to threaten Baja, the peninsula should remain alert to systems in the Eastern Pacific longer than normal. November sees only a handful of systems in all the whole of the Eastern Pacific since 1948. The earliest tropical cyclone to make landfall on the peninsula used to be August 14, but Tropical Storm Blanca in 2014 pushed that back to the first week of June, more than 70 days earlier. The early start to the season was confirmed again in 2018 with Tropical Storm Bud the middle of June. But the end of October brings a sigh of relief, the landfall of a powerful system becomes more remote and we recover pretty quickly here on the peninsula from the lesser systems. Let's hope Mother Nature got the memo this year and we call the Hurricane Season a Wrap on October 17.